What was I doing without LE MAC Lavender Whip before ? I've been wanting to venture into purple lipstick for a while now. I've had a few other plum toned purple's but I wanted something light & sweet. The lovely Elly from Ellys Makeup Bag was having a blog sale and when I saw that she was selling Lavender Whip, I did a quick google lipstick swatch and decided I had to have it. Before I knew it I had recieved my parcel and was overjoyed. It's not overbearing or too light when I swipe on just the once it's more a pink / purple tone against my lips after 3 swatches I get the above texture and colour pay off. I'm in love! 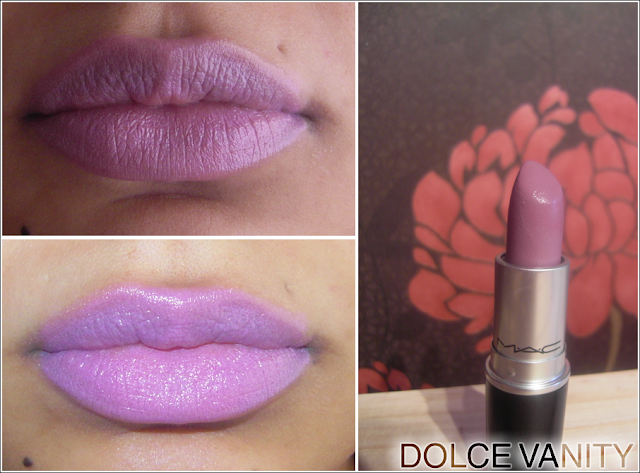 Do you wear purple lipstick ? If so what is your favourite, I'd love to know.